Disney is one of the studios trying to get into the party with their own take on the classic story, and if things go the way they seem to be going, it could be a very interesting movie to follow. Production Weekly has shared word that Sam Mendes is the top choice to direct Oz: The Great and Powerful, which is described as a collection of elements from author Frank L. Baum’s various stories and ideas that concentrates on the Wizard as a “charlatan who’s part of a traveling circus but goes on a similar odyssey as Dorothy when he mysteriously lands in Oz.” Even better — it appears that none other than Robert Downey Jr. is interested in playing the Wizard. This would make plenty of sense with the news yesterday that Mendes’s gig directing the newest James Bond movie has been halted indefinitely. Even Downey Jr. seems perfect in all of this considering that current James Bond Daniel Craig replaced him on Jon Favreau’s Cowboys & Aliens adaptation. The script for the film — originally titled Brick — is penned by Mitchell Kapner, who has previously written both The Whole Nine Yards and its sequel, as well as Romeo Must Die. After Tim Burton’s Alice in Wonderland brought so much money to Disney’s door, it’s not shock at all that they want to get this going. There’s not many better titles than The Wizard of Oz to try and replicate that kind of highly-stylized fairy tale production they delivered in Alice, despite the mediocre reviews. 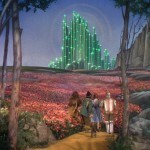 Other studios currently developing Oz movies are Universal and Warner Brothers. Universal is hoping to produce a film based on the hit Broadway show, Wicked, while WB has two potentials that they’re pondering over. One of these is simply called Oz, and it’s being developed by the production studio behind The Twilight Saga, and written by Shrek Forever After scribe Darren Lemke. The other title is one we’ve heard the most about: the darker vision written by Josh Olson (A History of Violence) and possibly produced in one way or another by Todd McFarlane. Much drama has risen from that project as McFarlane, Olson, and the studio have had troubles seeing eye-to-eye. It’s never short and simple when The Wizard of Oz is the discussion, folks. Which of these, if any of them, would you most want to see happen?